The Rt Hon John Redwood MP and other members of the Lords & Commons Cricket Club verses the Marylebone Cricket Club at Lords Cricket Ground on 16th June 2013. Nigel Adams holds the bat in the middle. Link to a brief video of the match courtesy of Chris Guyver: John Redwood cover drive Lord’s 16th June 2013. 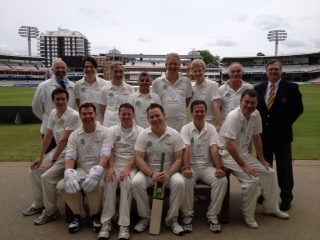 This was a privilege for the Lords and Commons to be able to play at Lords on the Nursery Ground against the MCC. Their team contained many good cricketers, so we were delighted to hold on at the end for a draw despite the return of the very fast opening bowlers trying to wrap up our innings. Nigel Adams was the Lords and Commons hero, managing an unbeaten century.